And then there was ‘Juan Indian left... Sorry ‘bout that Folks, just couldn’t resist, especially with Dr. Colin Kolles constant barking on ‘bout having secured the services of “The Speediest Indian,” nee Narain Karthikeyan – which was a real shock to Mwah when it was divulged way back in the beginning of January. And with less than 3-weeks remaining until Australia, it was finally made official that Vitantonio Liuzzi would be driving HRT’s second racecar and thus, the 2011 Grid was finally set – just a scant 3-days prior to the team’s 2011 challenger, the F111 breaking cover at Barcelona during the final test session. And according to Adam Cooper, the F111 utilizes a 2010-spec Williams Gearbox, who are providing the chassis hindquarters. While HRT won’t be running KERS, a la its Newboyz competitors Team Lotus and Virgin; as both Hispania & Virgin will use a lower spec ‘Cossie lump vs. Williams KERS version... Interestingly, the chassis monocoque was built by composite specialist CarboTech of Austria – who’ve steadily been building up their F1 clientele. Hmm? 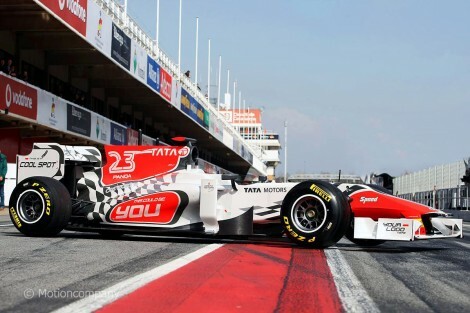 Wouldn’t it be funny if ‘Tonio could end up challenging the Force India’s for championship points this season? Hispania joins the Party - FINALLY!